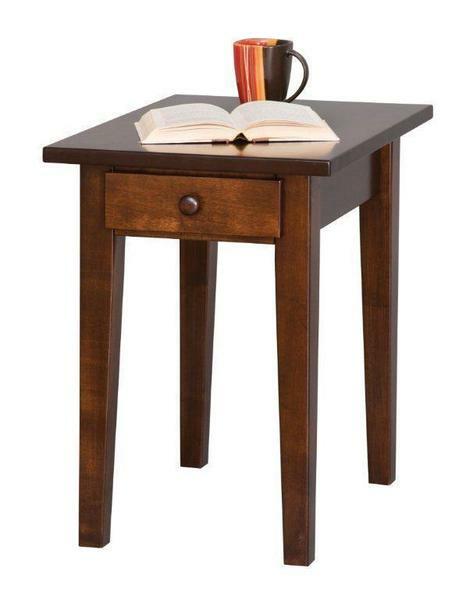 The simple charm of our Amish Handcrafted Shaker End Table will add beauty to your home for many years. Choose from our Amish Small End Table which measures 25" high by 16" wide by 22" deep or our larger hardwood End Table which measures 25" high by 18" wide by 24" deep. The larger Shaker End Table also has a drawer on full extension drawer slides with a simple shaker style wood knob. Choose to have one of these end tables made in your choice of oak, brown maple or cherry. The Shaker End Table shown is the large size with a stunning combination of brown maple and rich tobacco stain. Check out the matching Shaker Sofa Table and Shaker Coffee Table to complete your set. Please feel free to give us a call at 866-272-6773 with any questions that you may have.